Explosion proof cylinder heaters from HeatAuthority.com are certified safe, quality built in the USA and the UK and meet ALL industry safety standards and regulations. When working with compressed gases, each substance has its “sweet spot” – as temperature drops so does PSIG. By using a Powerblanket or BriskHeat cylinder wrap, gases can be heated and maintained at optimal temperatures allowing for maximum safe output. Keep your pressure up, extend “gas mileage”, and eliminate unnecessary refills regardless of outdoor weather or working conditions. 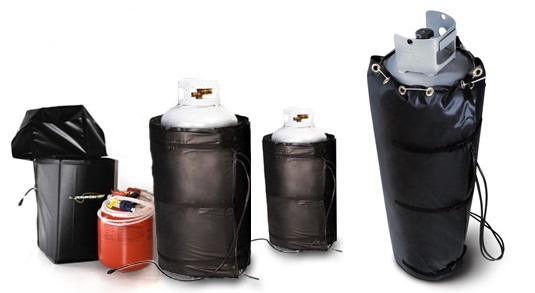 Intrinsically save and built to operate in Hazardous Area locations, these explosion proof cylinder warmers will perform. Proper procedures must be followed and extreme caution exercised when working with flammable materials. HeatAuthority.com only offers the best equipment available on the market today. Avoid costly mistakes, use only the best. Visit our website, give us a call or drop us an email for pricing and availability. One of our helpful team specialists will assist you in resolving any questions you may have. We know the industry and we can provide quality products with certification on ALL of our Class1, Zone1, Division 1 & 2 Explosion Proof Cylinder Heaters.